Maurizio Pellegrin was born in Venice, July 21st 1956, Italy. He lives in New York and Venice. He holds a Master degree in Art History at Ca’ Foscari University, Venice, at the Faculty of Literature and Philosophy. He studied Sociology at New School University, and Eastern Philosophy at New York University, New York. He studied at the Academy of Fine Arts of Venice, and he holds the equivalent of the American MFA in Studio Art. Pellegrin was the Dean of the National Academy School at the National Academy Museum and School in New York where he was also the curator of the gallery. He was the Director of the Venice Program Master of Art at New York University and taught Phenomenology of the Arts and Advanced Studio at Teachers College, Columbia University. In addition, he taught Modern Design and Architecture at Rhode Island School of Design. He is currently the Executive Director and founder of the New York School of the Arts and of the Hub Cultural Center in New York City. 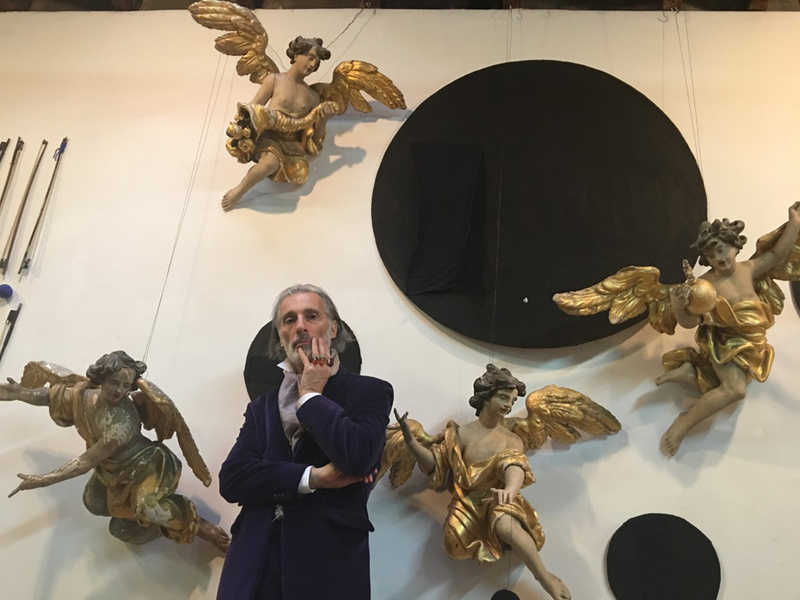 Thanks to his international experience, Pellegrin was appointed in 2017 as Chief Executive of Cultural Affairs at two ancient Venetian Institutions, I.R.E. and Fondazione Venezia. There he has created the program Observatory for the Arts whose objective is to sustain cultural debate, to maintain the Institutions’ historical sites and overall to support life itself in Venice. Pellegrin’s work has been the subject of more than 150 solo exhibitions and hundreds of group exhibitions in international galleries and museums. His works are in major private and public collections worldwide. There is a vast literature on his work. He is the author and subject of more than 30 monographs, and his work has been published in more than 500 articles and essays. Maurizio began showing his work in the early Eighties. By the middle of the decade, he was creating installations with his structured and organized system of objects and their symbolic associations. He arranged found objects that he had gathered during his travels around the world, channeling his passion and knowledge of antiquities through his work. Maurizio has always been interested in the way objects transmit energy and how the memory of their use remains. He sees objects as the testimony of human life and artifacts of memory, as well as the remains of life after death. He ascribes meaning to his work based on the science of Numerology, or the study of numbers and their influence on human life based on their symbolic and arithmetic values. His installations deal with the concept of space – both physical and philosophical – becoming universes organized by symbols and metaphors. The arrangements of objects and materials develop a new hierarchy in which their previous functions are drastically changed. Step by step, the capacity of communication and the inner power of the different elements (often wrapped by the artists to contain the energy) establish a new world of relations. Colors, which are always few, are then chosen for specific philosophical implications and psychological effects. The incorporation of mostly black and white photography into Maurizio’s work, along with video, began in the Nineties and continues to play an important role today. Like his poetry, the majority of these works are autobiographical.